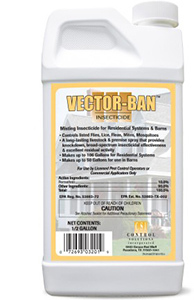 The Vector-Ban insecticide is used on Ants, Clover mites, Crickets, Earwigs, Millipedes, Sowbugs(Pillbugs) and spiders to help prevent infestation of buildings, treat the building foundation to a height of 2 to 3 feet, where pests are active and may find entrance. Vector-Ban Automatic Mosquito Misting System Insecticide for Homes & Barns controls listed flies, lice, fleas, mites and mosquitoes. The insecticide also treat surfaces around light fixtures on porches, in garages, around shrubbery and other places where these insects congregate. Vector-Ban Automatic Mosquito Misting System Insecticide is a long-lasting livestock and premise spray that provides knockdown, broad-spectrum insecticidal effectiveness and excellent residual activity. Would you like to see the Vector Ban Label? How about the Vector Ban MSDS sheet?